We were given a French press coffee maker for a wedding present and have been using it since. We feel we have the best coffee every day: fresh ground Colombian beans brewed in our French press. With my carafe disaster on New Year’s Day it was time to update ( my spare carafe was too small for every day). I was lucky to find this website and thrilled to work with Igor to get just the right products for us. Turns out the larger carafe is just what we needed! He promptly delivered as promised and will receive my business in the future. Thanks, Igor, for being you. I always learned that there are 8 ounces to a cup. So when I ordered an 8 cup French press, I got one the same size Ihad before Whitehead didn’t even hold 4 cups comfortably. I don’t get it. Since the 1950s, CHAMBORD is the brand that proudly stands for the best in classic French Coffee. 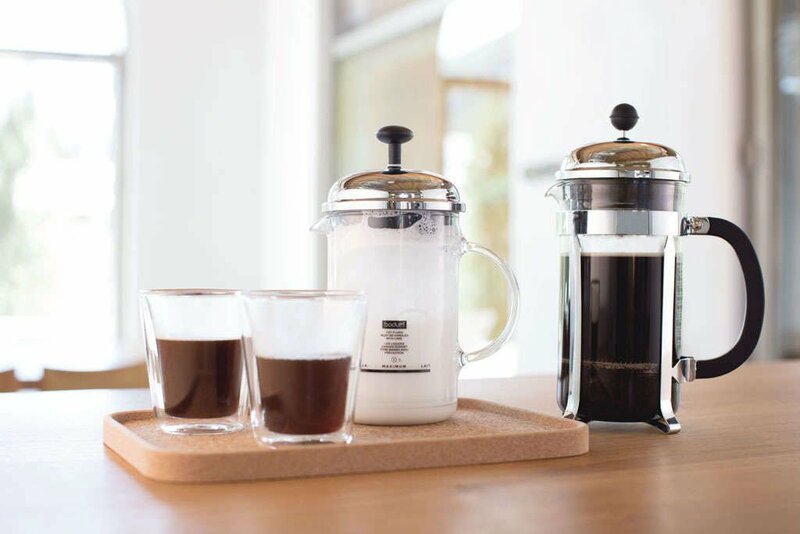 It stands the test of time because of the Bodum's commitment to quality and loyalty to its industry leading standard. 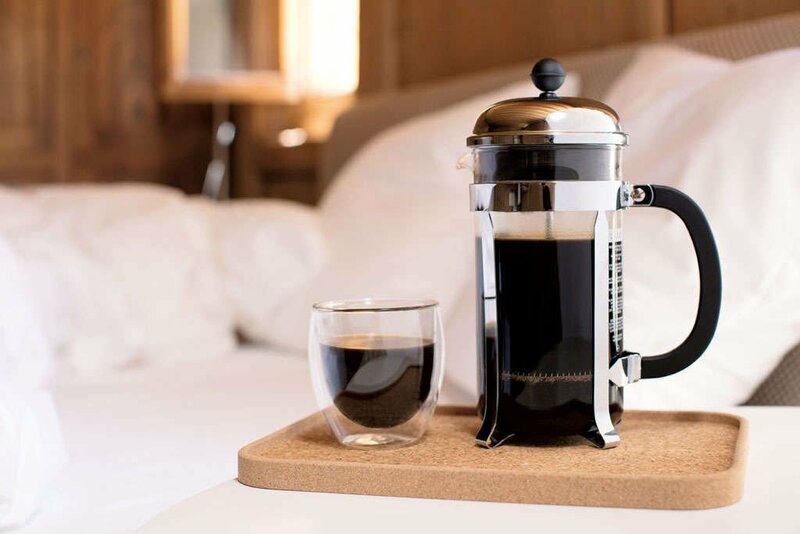 The same craftsmanship and passion that created the first Chambord French Press Coffee Maker is what you get in today's generation - only with modern features and technology. 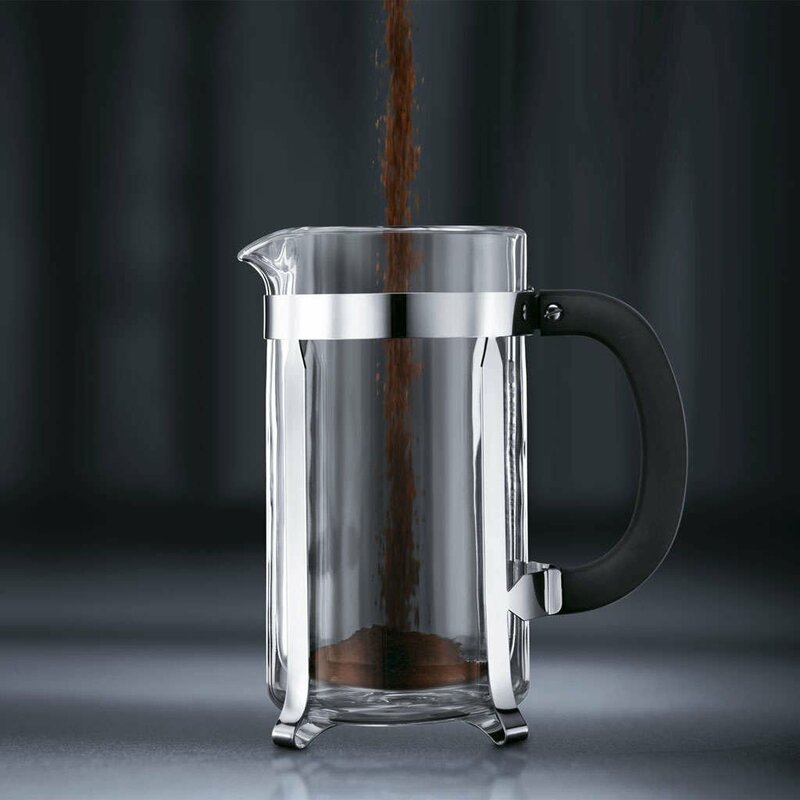 The steel and chrome framing or your Chambord French Press is made to withstand years of intense use without a drop in the quality of your beverages. Chrome plating adheres to strict ecological standards. That's right - the Bodum brand has gone green. Your handle is made of polypropylene with a stunning matte finish that provides you with pristine quality and a firm and comfortable grip. Most importantly, our process remains as simple as it was in the 1950s - you will always be able to make an incredible cup of coffee using the classic French Press method that we brought to the public. Simple is the only way to go when it comes to a great cup of coffee. Use only ground beans that are fresh and coarse. Keep your water between 92 and 96 degrees for best results. 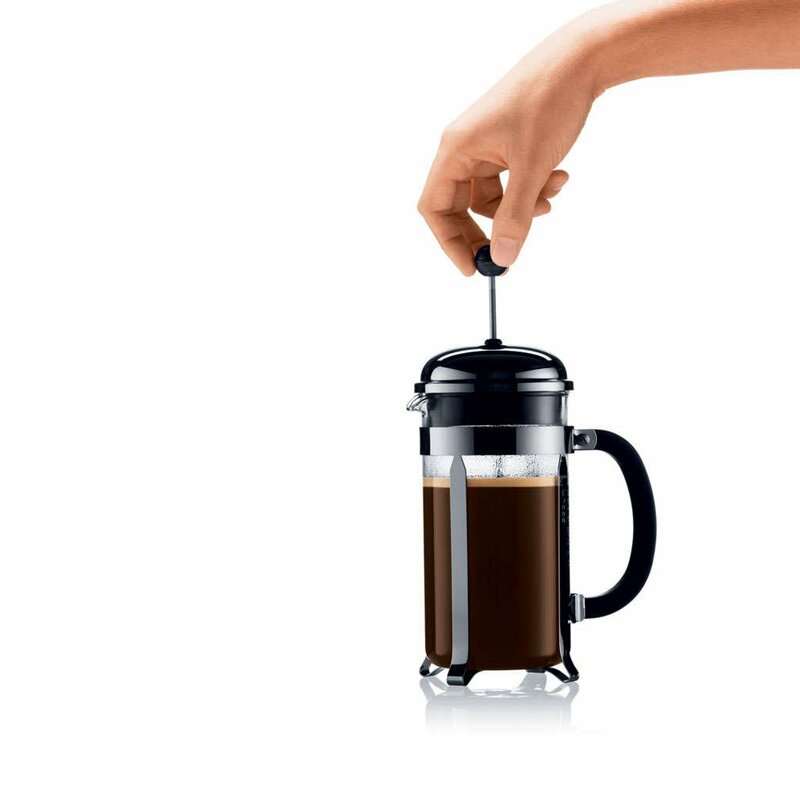 With these easy directions and your Chambord Coffee Maker, you will have a beautiful cup of coffee every single time. 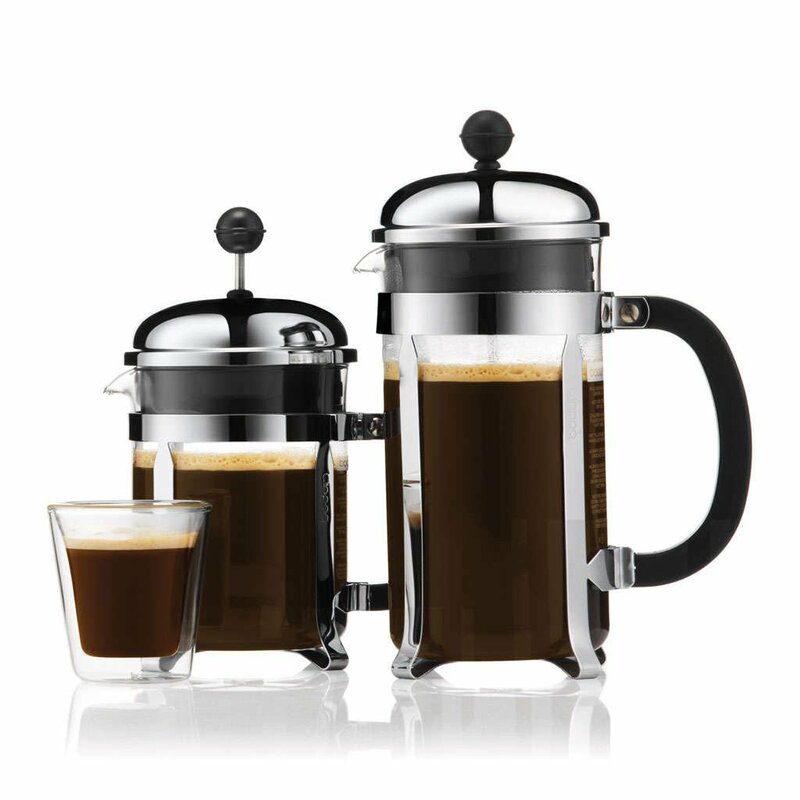 The Chambord French Press Coffee Maker comes in beautiful colors and finishes. You get the best of our classic designs and the best of today's technology as well. Chrome and steel plating meet an intuitive proprietary design to ensure that you always have the best of both worlds. All that you really need are great coarse beans, water between 92 and 96 degrees, and your Chambord. Over 70 years of coffee makers, we have given you all of the advantages of technology without losing what makes the brand great. Your Chambord comes with steel and chrome plating across the surface and a black polypropylele handle with a matte finish. You will always have a safe pour, and your Chambord can serve you as a conversation piece when it is not in use. You can get your Chambord in chrome or gold. Both looks fit right into your feng shui. Your Chambord is as easy to clean as it is to use. There are no hidden nooks and crannies to create sediment over time - simply wash and use again and again. EXCLUSIVE: Handcrafted Coffee Stir Paddle, 8.5"